Ed. Note: Nancy Alexander Reid was born at the Reid House on January 9, 1898. In 1980, she wrote some of her recollections in a brief essay titled "History of the Reid House". She died at the house on January 25, 1986 at the age of 88. 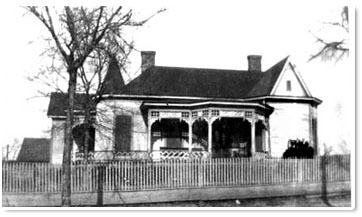 Prior to 1890, my uncle, Mr. Edward Solomon Reid, hired Mr. Howe and his son Clarence to build him a house in Matthews. Uncle Ed, as I called him, had heart pine lumber shipped from the Eastern part of North Carolina to the build the house. He, his wife and one child lived in the house for a few (three) years. My mother, who had previously married Dr. James S. Bell, had two daughters; Mary, who was three years old and Jessie, who lived to 19 years of age, was at that time about to marry Dr. Thomas Reid. They bought the house from Uncle Ed, who moved to Charlotte, and moved in. My sister Lida Reid Cochran and I were born in the house. There were three bedrooms on the left hand side of the house. On the right was a living room, dining room, kitchen and pantry. A hall separated the bedrooms from the rest of the house. The house was surrounded by a white picket fence which separated the front yard from the backyard. On the other side of the picket fence was a vegetable garden which was enclosed by a larger, taller picket fence. That fence was one of my favorite walking places. My mother and father planted the magnolia tree in the front yard shortly after they moved in. Copyright © 2018 Matthews Reid House. All rights reserved. Contact Webmaster.